Alternately known as Z.M. 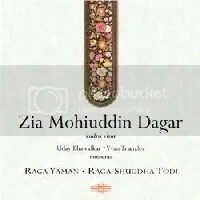 Dagar, Zia Mohiuddin Dagar was the master of rudra vina, a larged stringed instrument primarily used in Hindustani music. It sound closely resembles that of the sitar, but the rudra vina seems to get a deeper, more resonant tone than any sitar I’ve heard. Dagar’s bread and butter was the raga, a slow, meditative form of Indian classical music that slowly unfolds with circular melodies that gently wax and wane. I’m no expert on ragas, but I’ve always loved Dagar’s work because of the rumbling bass that centers the slow motion reverb of the sitar or rudra vina. Spirituality was never my strong suit, but Shuddha Todi taps into something larger than music for me. It is kind of a meditative tool in my life that provides my mind time to breathe and process the events of my day. There is no climax or crescendo, it just becomes what you need it to be at that moment. It’s amorphous qualities and psychedelic atmosphere kind of lifts to a place that few albums do. It fills up the room and all you can do is bathe in the waves of slowly plucked notes as they echo until another one rolls your way. If all you know of ragas and Indian classical music is Ravi Shankar, then check out Shuddha Todi and see a different facet of a music that reminds me of how music can transport you to other levels of consciousness. Although I’m not a religious person, certain albums, songs and performances have done a number on my noggin. Shuddha Todi/Raga Yaman belongs to that rare breed of music that taps into something indescribable as it whisks you off to some mental island where you feel impelled to examine life more closely than you would otherwise. I don’t listen to this often, but it mellows out the rough edges in my life and I couldn’t ask any more of a piece of recorded music.